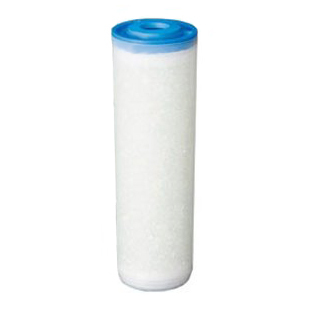 Home > Replacement Filters → Aries Fluoride Reduction Filter Cartridge 10"
Aries Fluoride Reduction Filter Cartridge 10" is a standard 2.5" x 10" Clear Cartridge that works in removing Fluoride from your drinking water. This specialty Fluoride filter achieves the removal process by utilizing the advanced media technology, SIR-900 - a granular aluminum oxide based adsorbent. The SIR-900 resin is designed not only to remove Fluoride but also several other contaminants such as arsenic and lead. Aries Fluoride Filter AR-10-F Cartridge fits most standard residential and industrial housings. It is manufactured using high quality media certified to effectively remove fluoride from drinking water sources such as city/municipal and well water. If your water source is well water, test it first as certain types of well water fluoride such as sodium fluoride are difficult to remove and may require either multiple cartridges or a Reverse Osmosis system. Resin media removes Fluoride, Arsenic and Lead. Superior physical stability and can be used over a wide pH range. Premium high capacity SIR-900 media. Oversized 10" body for maximum media fill/volume and better filtration. Fits standard and slim style housings. Looks excellent. It fits the standard filters from filterwater.com (I bought a 3 stage kit here 2yrs ago), and it is packed with a heft hefty amount of fluoride absorbing media. I'm going to get the Aries KDF+GAC and switch to Aries on the next filter change.